It’s built into our genes, as documented by E.O. Wilson’s new book, The Social Conquest of Earth. From birth, human beings experience themselves as individuals embedded in a social group. Children who are isolated at an early age tend not to thrive. If they survive, they become “feral” or “wild” children, usually without language or the ability to connect with others. So, as Aristotle noted, we are all social. Then why the recent concern on several websites, and in some keynote addresses, that social media, and by extension, social learning, “is dead”? Well, for one reason, using the word “dead” makes great attention-getting headlines. In this age of rapidly changing technologies, this idea is plausible because of the perception of the short shelf life of all technologies. But, this is a perception, based on vendors, writers, and consultants all chasing the “next big thing” to stay ahead on the change curve. What really happens is that new technologies are exciting for a while, then fade into the media background as they become commonplace, taken-for-granted, and replaced by a newer shiny object. It doesn’t mean they are dead. We confuse “social learning” with the concept of “learning with social media,” which is what we are usually talking about. The term “social learning” historically has several meanings, and the word has been reinvented with each new learning theory in psychology. Behaviorist theories of social learning hold that people learn new behaviors via three methods: through overt reinforcement, through clear punishment, or through observational learning of social influences in their environment. To understand the behaviors of an individual, it is essential to consider the social context in which he or she is operating. People learn from each other, an idea that almost no one disputes. The problem with behaviorism was that it refused to examine or discuss what was happening in the mind of an individual who was learning. It also reduced the behaviors being studied to small units of analysis that ignored influences beyond the organism (rat or human) that was being studied. This led to the rise of “cognitivism” in the 1960s in North America and to neurological research that tried to connect physical brain activities with indicators of learning. It also gave rise to new social learning theories, such as constructivism, that referenced both what was happening inside a person and the impact of the external social environment on learning. Although he is still not well known outside of school environments, the educational theory of Lev Vygotsky (1896-1934), a social psychologist who lived through the Russian Revolution, is very relevant for understanding social learning. Vygotsky’s work has only become widely known in English since the publication of the translation of his major book, Mind, and Society: The Development of Higher Mental Processes, in 1972. Vygotsky’s social development theory states that social interaction is the foundation of human development, consciousness, and cognition. His followers use the metaphor of scaffolding to illustrate how our skills are built one upon the other, with the help of people around us. He calls those who know more than we do More Knowledgeable Others (MKO) and shows how they have an important role to play in our learning. His concept of the Zone of Proximal Development (ZPD) is also interesting. The ZPD is the distance between a learner’s ability to perform a task under expert guidance, and with peer collaboration, and the learner’s ability to solve the problem independently without help. According to Vygotsky, social learning occurs in this zone. Good teachers know effective teaching often involves assessing the current knowledge level of a learner and introducing materials related to the learner’s current knowledge that move the learner to “the next step” of what the person needs to know. This is like scaffolding as articulated by Vygotsky. But being social is not just a matter of having other people, more experienced than us, teaching us what we need to know. The social aspect also occurs because we are embedded in a culture we observe and where we act and share a common life with others. Language tools such as speech and writing are developed within a culture and carry meaning and concepts in their words. These words mediate the social environment through which each of us moves. In contrast with the “instructions” model of learning, where an instructor transmits information to students, Vygotsky believed learners should play an active role in their own learning. In his view, a trainer should become more of a collaborator with his or her students as they individually construct their own meanings from their life experiences. Vygotsky’s theory nicely aligns with the current constructivist theory of learning. “Social learning” is also in vogue as a term for learning via “social media.” Leading analysts of social media use the term social learning in this sense. But this is a circular argument; it assumes learning is social just because we use media that is called social. We call media social when there is the potential for two or more people to interact online in some fashion. Social media refers to the Internet and mobile technologies that allow networked social interactions (because it networks them, they originally referred social media to as “social networking”). In particular, social media refers to new technologies that allow “many to many” relationships rather than connections that are dominated by one person. Social media are part of Web 2.0, but Web 2.0 is a broader term that also refers to other aspects of information technologies such as access to “cloud-based” databases and distributed content. Social media offers great new opportunities to connect with a wide range of people who you might otherwise never meet. For those who take advantage of this opportunity, how does effective and useful learning take place? Since the popularization of MySpace and Facebook within the past decade, social media has exploded onto the learning and development scene. Facilitating learning has broken away from the classroom model and can be found in many places on the Internet and mobile networks. While traditional channels of information are in decline, social media is not dead. Print newspapers and magazines are rapidly migrating to an online format that almost always has a social component for commenting or contributing other user-generated content. People want to ask questions, state opinions, support or challenge the argument, and most of, be involved. The traditional coffee shop discussion over the morning paper has been upgraded to a global cacophony of information exchange. What does this mean for a corporation? It means that people will demand in the workplace what they are experiencing on the outside: efficient, effective, and participatory routes for learning. This is not against the corporation’s best interests. Lombardo and Eichinger (1996) have suggested that formal learning is a secondary source of workplace knowledge. Their 70-20-10 model holds that 70 percent of learning applicable to the workplace is derived from practical experience, usually working with others, 20 percent is derived from just observing the examples of others, and 10 percent is derived from formal education. 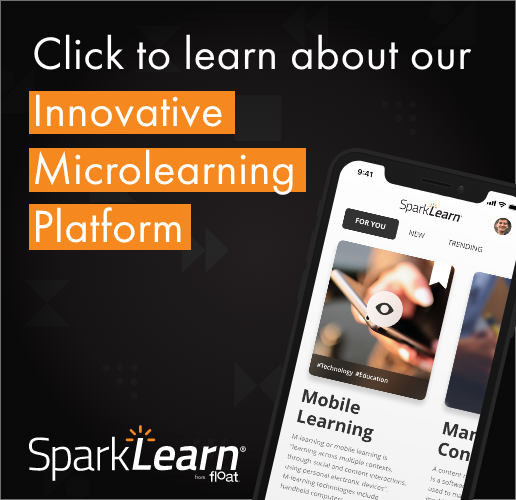 This means that, according to this model, 90 percent of workplace learning is informal, and these days, much of that interaction is mediated by mobile technologies. If this figure is accurate, or even close to accurate, then this is where an organization should place its focus for optimizing training, learning, and development. Contact us to learn more about incorporating social learning into your mobile strategy. In case you needed even more proof that mobile learning has arrived, Float Mobile Learning’s apps were downloaded nearly 30,000 times last month. The downloads came largely as the result of offering two of our apps – RabbleBrowser and Sandbox, normally $2.99 apiece – for free during SXSWedu. RabbleBrowser is a collaborative Web browsing tool for the iPad that lets teachers or other facilitators share files and URLs with students or colleagues. Earlier this year, it made a Forbes list of 10 applications to make your business more productive. Sandbox is a Web browsing tool that restricts users to only the websites you pick. The application could be used inside a classroom, retail store, corporate headquarters or restaurant. Both applications are available for volume purchasing and educational discounts.